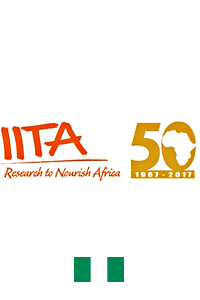 IITA is an international non-profit agricultural research-for-development (R4D) organization established in 1967, governed by a Board of Trustees, and a member of the CGIAR Consortium. Our R4D approach is anchored on the development needs of the tropics. We work with partners to enhance crop quality and productivity, reduce producer and consumer risks, and generate wealth from agriculture. We use the R4D model in setting a research course that addresses major development problems in Africa rather than simply contributing to scientific knowledge. It has proven to be an effective mechanism for agricultural research development. We and our partners have delivered about 70% of the international research impact in sun-Saharan Africa in the last three decades. In response to specific development needs, we work with research and development partners (research, development and extension actors, farmer organizations, NGOs, the private sector, and governments) to deliver research outputs that are achieving an initial outcome. We then use this research outcome to excite and attract more partners who will ultimately take charge of the up scaling and outscaling of the technologies by broadening participation and increasing the chances of success and ultimate development impact. In particular, we are committed to forging closer links with Advanced Research Institutes, National Agricultural Research and Extension Systems, and the private sector that are eager to contribute to high-quality R4D, commercialization, and market development activities in technical assistance. We have more than 125 internationally recruited scientists from about 35 countries and 900 nationally recruited staff based in various stations across Africa.